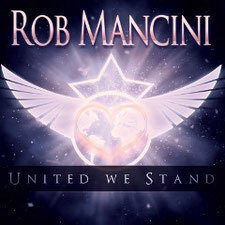 Rob Mancini and his band have announced the production of his new 12 Track album “Naked” to be released around the end of April 2013. Prior to this and with Christmas coming up, the special edition 4 track EP “United We Stand” is now available for download on December 15th on the bands’ website including a special piano/orchestral version of “United We Stand” and a pre release of the track “Heartline” from the upcoming 2013 album “Naked”. The EP features Paul Ward (Acoustic Guitars on "Edge Of A Broken Heart") and John Pratt (Vocals on "United We Stand") as guest musicians. The majority of the generated revenue of this EP will be donated to the Make-a-Wish Foundation which grants wishes to children in countries around the world, giving them the hope, strength and joy they need during times when they need those things the most. Each year, thousands of these wishes come true, helping communities, families and children overcome the challenges of their conditions with renewed spirits, thanks to the life-changing power of a wish.